There was a time when “kitchen islands” consisted of sturdy tables set in the center of the room and… only in kitchens large enough to accommodate them. In the 1930s, Frank Lloyd Wright brought kitchen islands to suburban homes with his “open plan” living space. They have continued to evolve ever since. Currently, the island has literally become the hub of our homes for doing more tasks than just cooking. They’ve become the center for socialization. If you’re looking to modify an island already in place or add one to your kitchen, it’s best to work with a professional to draw up a floor plan. An island should have about three feet of space around it. If it’s too large, the kitchen becomes crowded. Too small and not only does it not look good, it may not fit in with the normal workflow. Bottom line, it shouldn’t be too close to doors or other countertops but you don’t want it to be standing off by itself. The next consideration is how you want to use it. Islands can be strictly functional by providing additional countertop space and storage. But as suggested above, islands are where people interact. While the cook is chopping tomatoes, he can talk to family about their day, help the kids do homework, and just show off a little as guests nibble on appetizers as dinner is prepared. This brings up the question of how many people do you want to be able to sit around it? And do you want one level or two? 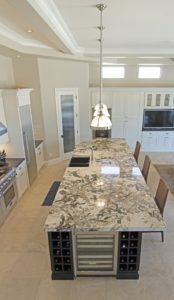 Take a look at our Projects to see what we can do to make your island enhance your kitchen experience.